BRANTFORD – Passersby at 32 Market St. in Brantford may notice a lot of activity. Inside, students, artists, staff, faculty, and members of the broader community are cutting, engraving and riveting metal, and engaging in many important conversations. The space, currently being used as a pop-up art studio, is home to a creative community project titled We Will Help Each Other to be Great and Good. Led by faculty member Ian MacRae and artist Dave Hind, the initiative will result in the completion of a 16’ x 8’, two-dimensional work of art. MacRae describes the project as a research-driven collaboration that aims to engage with the complexities of Canadian history, politics, identity, spirituality, historical erasure, and ecological relations. The project draws its inspiration from a 1910 document titled Memorial to Sir Wilfrid Laurier. The document was presented to then Prime Minister Laurier in August of 1910 in Kamloops, BC by three First Nation chiefs: John Tetlenitsa (Nlaka’pamux), Petit Louis (Secwépemc), and John Chilahista (Syilx). Accompanying the chiefs was Father LeJeune, a French Catholic priest who acted as intermediary and interpreter. Written by James Teit, a hunting guide, ethnographer, political organizer and activist who lived in the region, at its heart the Memorial represents a civil commitment to a struggle with the Canadian government for a just relationship between equals, an articulation of Indigenous political authority and sovereignty, and a firm commitment to finding common ground. 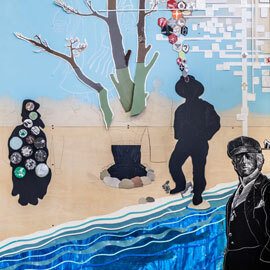 While MacRae leads the research and discussion side of the project, award-winning artist David Hind and arts educator and Laurier alumna Gail Myke – with support from six art assistants – lead the project’s creative components. Participants in the project apprentice to Hind’s method, employing the ‘metal quilt’ technique that is prominent in much of his work, and makes use of recycled aluminum and found materials. Students from two courses – Indigenous Writers in English and Arctic Dreams and Nightmares – work regularly on the project. Additionally, members of the community and special guests are invited to take part. To date several contributors, including artists Shelley Niro and Leona Skye, Faith Keeper Norma General, and members of the Six Nations Men’s Fire have attended the studio to engage in dialogue and present their knowledge. “The door is open and we invite all members of the community to come and share in the conversation, the creation, and the community building that is happening in this space,” said MacRae. The studio is open weekdays from 9 a.m. to 4 p.m. Individuals are welcome to drop in. Those interested in bringing a group to the space can contact the project’s communications coordinator, Jessica Malcolm. The work is expected to be complete and ready for official unveiling on April 1. By that time, MacRae estimates that 200 or more individuals will have contributed to the work itself, and taken part in conversations inspired by the Memorial.